Easter bunny came last night and he left easter eggs in a plastic container because we’ve had a marauding chocolate loving cockroach in this house and I’m too scared to leave any food out just in case. Now I have to go and do Easter bunny’s job for him so JJ can still have the thrill of the easter egg hunt. Yesterday was a lovely afternoon. A friend I haven’t seen for 18 years (I can’t believe it was that long), and her husband came around for lunch. They live in Sydney and are here visiting family and friends. I took some photos but because this is a quick post I’ll write more about that later. Today we’re off to visit a friend for her birthday and we’re staying the night so I’d better go and get organised for that. 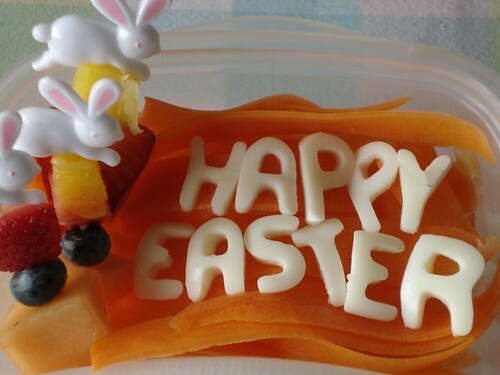 Hope you all enjoy Easter and the long weekend. It’s beautiful autumn weather here – just gorgeous. And it’s a very happy Easter here in the UK as we get our “new to us” dog tomorrow. Name of Jack, he’s described as a lurcher cross (although I don’t know how that is possible when lurcher is a type of cross-breed anyway). He’s the original Heinz 57. Mainly white, his front end is collie but with a head that looks more reminiscent of a German Shepherd, and his back end is some sort of hound (possibly black and tan greyhound) with long white legs. Someone tried to dock his tail at some point in his life – very badly. What a mess to look at but he’s so loving that I couldn’t resist him. M&B – the chocolate is safe in the fridge for as long as it lasts anyway. Michelle, don’t forget that as it gets warmer for you it gets colder here. Today was gorgeous weather as well. We’ve been spoilt over Easter. Hazel, how exciting. I hope it goes well for you all.